When you want something warm, spicy and satisfying to eat, a bowl of vegetarian gumbo just might suit your tastebuds. Made with or without vegetarian sausage, this hearty dish is made to satisfy. This recipe makes a moderately spicey gumbo that serves about six people as a main course when using soup bowls, or 8 to 10 people as a side dish when served in cups. If you decide to skip the vegetarian sausage, begin with step two of the instructions. In a large stock pot, cook the vegetarian sausage according to the package direction. Remove when fully cooked and transfer from the pot to a bowl and set aside. Add the olive oil to the stock pot and heat on medium for approximately 30 seconds. Stir in the garlic and continue heating for about 45 seconds to 1 minute, but do not brown the garlic. Stir the flour into the oil and garlic mix until it's fully combined. Add the pepper, onion, and celery to the pot and cook over medium heat for about 10 minutes or until the onions are soft but not yet translucent. Stir occasionally to ensure even cooking. When the vegetables are tender but not mushy, add the tomatoes, sausage, kidney beans, corn, okra, broth, spices, lemon juice and hot sauce. Turn the heat up to medium high and bring to a near boil, stirring occasionally. When the gumbo almost reaches a boil, add the instant rice to the pot and continue cooking on medium heat for about 20 minutes to give enough time for the flavors to blend well. Serve hot with some crusty bread and a salad. You can also add a little more hot sauce to your bowl if you like your gumbo extra spicey. 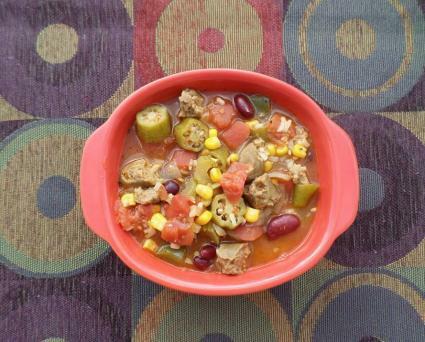 There are no hard rules about making vegetarian gumbo as long as you only use vegetarian ingredients. If you don't care for a particular ingredient in this recipe, feel free to leave it out and substitute something else you like. For example, you could use quinoa instead of rice or tofu instead of vegetarian sausage. A little of this, a little of that, and before you know it you'll have your own original gumbo recipe you can brag about.